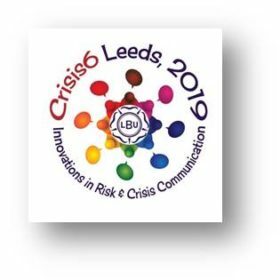 Leeds Beckett University, UK, is looking forward to welcoming the ECREA Crisis Communication Section to the 6th International Crisis Communication Conference in 2019. The conference on the theme “Innovations in the Field of Risk & Crisis Communication” will be held on October 3-5 in Leeds, UK, and preceded by 3 pre-conferences (Graduate Student Workshop, Simulation Workshop, Social Media Analysis). The deadline for abstract submission is 15 April, with notifications sent on or about 15 May, 2019: We are looking for an exploration of new approaches to theory, methodology, education and training, practice, as well as the intersection of technology in the context of risk and crisis. We are looking for cross-disciplinary work with communication, journalism, business, marketing, health, law politics, policing, cross-cultural research, education and training. We are inviting you to think about where the field has been and where it is can and should go. We would especially invite our practitioners to share their own experiences and best practices so that we can all learn from each other. Traditional research presentations, panel discussions, demonstrations, and theme discussions will all be welcome.